Can an Oral Piercing be Bad for Oral Health? Piercings of any kind can look cool, and some people feel they help them express themselves. As with any piercing, oral piercings also come with their own set of risks. At my Chicago dental office, we’re here not to discourage patients from getting a piercing if that’s what they want, but to educate them on several potential problems associated with oral piercings. Oral piercings can lead to a whole host of oral health issues. Before you make a decision to get one, we encourage to know the risks. 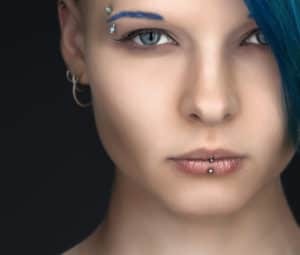 General Difficulties–Introducing a piercing to your mouth, whether in the form of a tongue, cheek, or lip piercing, can affect your daily activities like eating and talking. Tooth Damage. –Piercings come with jewelry. Jewelry is hard in texture. When something hard is introduced to the mouth and banged off teeth repeatedly, damage will occur. Whether it’s a little chip or a big break, tooth damage allows bacteria to enter the tooth and leads to decay. Decay may then require a filling or, if left alone, even a root canal. Gum Disease. –Again, since there is something hard in the mouth, the chance for trauma to the teeth or gums is greatly increased. If your piercing irritates the gums, leading to damage, gum disease is a real possibility. An opening the gums allows bacteria to get below the teeth, leading to gum disease. Infection. –Perhaps the most serious concern of an oral piercing, like any piercing, is infection. But what makes oral infections a little more serious is that they are in the mouth. The mouth is wet and warm, which is the perfect place for bacteria to multiply. If a piercing leads to infection, the fact that the mouth is already home to millions of bacteria isn’t good. Infections that become serious can even cause the tongue to swell, blocking the airway and making it hard to breathe. Taking care of your oral piercing can really help decrease the likelihood of a problem. Make sure you clean the area thoroughly and often, and rinse your mouth after eating to lower the chance of infection. Ensure the jewelry is secure to avoid a piece coming loose, causing you bite it and crack a tooth. Remember the signs of infection like redness, fever, chills, or swelling and seek medical attention immediately if you have any symptoms. If you do decide to get an oral piercing, or if you already have one, and notice signs of infection or your teeth become damaged, call my dental office in Chicago as soon as you can. We’ll get you in for an appointment and talk about the best treatment options to help.